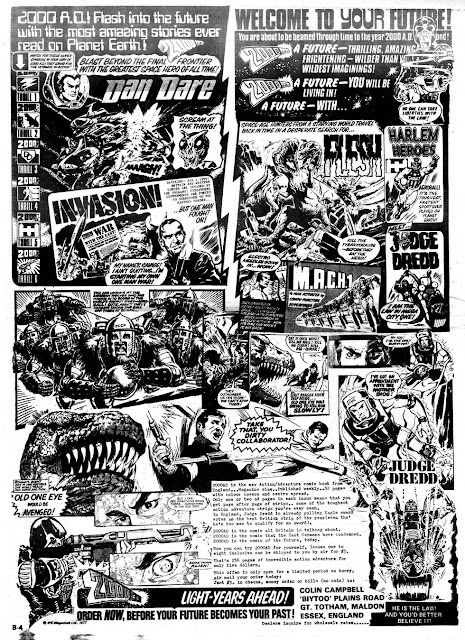 I'd always assumed that US comic book fans first encountered 2000AD in the early eighties with the launch of Titan's JUDGE DREDD albums, followed by the US format comics issued under their Eagle Comics banner. I also have an issue of the British fanzine BEM, published in the States (confusing eh?) which had a comprehensive overview of Tharg's legion of anti-heroes. I don't have it to hand so I can't say exactly when that was published (but it IS a good read). But, I think THIS might be the first sighting. It's an advert from the pages of THE COMIC JOURNAL offering US readers the chance to subscribe to imported copies of the British weekly. The advert appeared in THE COMICS JOURNAL issue 35, cover-dated June 1977. The first Prog landed in British newsagents in February. It's a great line-up of classic characters but note how a certain Judge, despite appearing three times in the advert, doesn't get anything like top billing. Times will change. You have to admit... this is one cool looking advert. I wonder how many American readers realised what they were missing at this moment? I doubt there is any connection (anyone know?) but the Essex town of Maldon (which featured on the BBC ONE series THE MURDER GAME if anyone remembers that generally underrated show) also housed THE PERFECT MAILING CO, legendary source of Marvel UK subscriptions and back issues throughout the eighties. Great Totham is actually a village outside Maldon town itself... but it's close enough.